In addition to creating our industry-leading editorial coverage, our team of analysts and researchers specialize in custom research for companies, institutions, and individual investors. Deeply researched and beautifully presented, these are comprehensive reports around bitcoin, altcoins, or ICOs, created by the experts at Bitcoin Market Journal. Our corporate clients hire us for in-depth research into a particular cryptocurrency, comparing ICOs, or analyzing how blockchain is affecting their industries. We also create custom training programs on bitcoin, altcoins, and Initial Coin Offerings. From ICO price analysis to historic ICO returns, our team of Ivy League-trained researchers create comprehensive, easy-to-understand reports around specific questions. We answer questions from ICO Return on Investment to capital raises by industry. We do the “deep dig” into a particular ICO or investment opportunity, using our in-depth analysis tools. We also evaluate ICOs for founding teams, to show how your offering stacks up in relation to ICO benchmarks. In addition to ICOs, clients hire us to analyze a wide array of tokens, digital currencies, and crypto assets. Download a sample report here on the digital currency Ripple (XRP), because it will give you a flavor of what we can do for you. 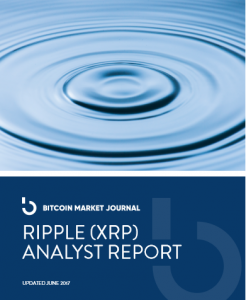 Click here to download the Bitcoin Market Journal Ripple (XRP) report. Thanks for your interest!